This arrived in Dad's Coral Gables driveway August 1992, followed closely thereafter by hurricane Andrew, forcing a frantic retreat on I-95 north to someplace above sea level with a rentable mattress. God bless Orlando? The car survived; Miami was knocked for a loop. One cute trick it had was to pour significant quantities of morning dew off the gutterless roof panels through the open window into the lap of the driver just heading off to work. Dad gave the Honda engineers significant demerits for that feature. He also admitted missing the rough personality of the CRX (which he'd traded for the del Sol) and which had perhaps less elegance but more oomph. 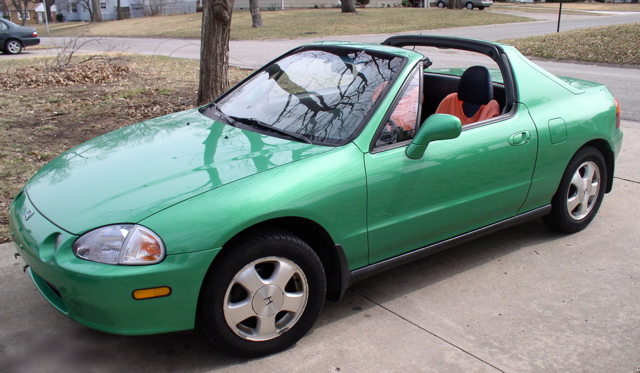 The del Sol moved to Arizona with Dad and was sold with a couple hundred K-miles.